To investigate the feasibility and safe zone of S1-4 for sacral screw placement, a total of 62 adult patients spiral computed tomography images of pelvis were analyzed and reconstructed using Mimics version 15.0 software. The safe zone of the pedicle screws were calculated, the entry points of sacral pedicle at S1-S4 were determined, and the screw trajectory, length, width and angle was measured in the three dimensional reconstruction of pelvis. The mean entry point of S1 pedicle screws was lateral to basilar part of S1 superior articular process. The entry points of S2-4 were approximately superior to the midpoint of a line connecting the inferior outer edge of the upper posterior foramen and superior outer edge of the lower posterior foramen. For S2-4, the entry point outward change gradually, the diameter and length of screw became smaller, the angle increase successively. There was a statistical difference in the entry point of S2 in gender group, the diameter of screw in S1 and S3 in gender group respectively also showed statistical difference (P<0.05). The results demonstrate the ideal entry points of sacral pedicle at S1-S4, and precisely describe the trajectory, length, width and angle of screws. These defined details should be taken into consideration during surgical procedures. The sacrum is being recognized as an important target point for sacral fixation during posterior sacroiliac or lumbosacral fusion. The S1 pedicle screws were most frequently used for sacral fixation. Varieties of techniques for pedicle screw placement have been introduced. However, anatomic variants, osteolytic lesion or trauma factors often cause difficulty for surgeons to use single segment of pedicle screws. Improper screw implantation can cause nerve and vascular injury. Therefore, we questioned the feasibility of using sacral screws in other segments to improve bony fixation. The purpose of this study was to point out the feasibility of sacral fixation in S1-S4 and investigate the safe zone for sacral screw placement by using the software of MIMICS. For this study, pelvic spiral CT data was collected in our hospital from June 2013 to Aug 2014. Informed patient consent for further research applications of individual image data was obtained. Pelvic traumatic residuals as well as inflammatory, tumorous or high-grade degenerative alterations were excluded. Overall, 61 data sets were used for further analysis. There were 27 males and 34 females with a mean age of 49.7 y (range 15-72). All of the CT raw data were downloaded and imported into the software of Mimics version 15.0. This program converts the CT scan images into three dimensional anatomical structures and all parameters were measured with high accuracy. The CT scan image was imported into Mimics interface, re-slice project was used to create the sagittal oblique views through the pelvis parallel to the sacral pedicle, then using threshold to define the bone to calculate 3D models of pelvis. Define the safe zone of sacral screws. First, identify the medial edge of the anterior sacral foraminas in the 3D model, then drawing three lines pass the medial edge of the anterior sacral foramina, the point lateral to the spinal canal and posterior iliac crest on the transverse plane at S1-2 (Figure 1a). Figure 1: a, b) The lines define the boader of the safe zone of sacral screws at S1/2 and S3/4 respectively. c, d) The safe zone of sacral screws. Drawing a line from the medial edge of the anterior sacral foramina to lateral sacral crest and two lines from the medial edge of the anterior sacral foramina and the anterior midpoint of the vertebral body respectively to the point lateral to the spinal canal at S3\4 (Figure 1b). These lines were the borders of the safe zone (Figures 1c and 1d). Finally, calculate 3D model of the safe zone and separated from the pelvis (Figure 2a). Figure 2: a) 3D model of the safe zone which looks like capital “K” on the transverse plane. b) The shape of the narrowest portion of “K” at S1-2 shows inverted triangle on coronal section. c) The maximum diameter of an intraosseous cylinder traversing the section represents the trajectory for maximal safe zone size of a pedicle screw. d) The narrowest portion of “K” at S3-4 is diamond-shaped. After that, make a coronal section at the narrowest portion of the 3D model, and the maximum diameter of an intraosseous cylinder traversing the section represents the trajectory for maximal safe zone size of a pedicle screw (Figure 2c). Parameters of the pedicle screw were measured on the transverse plane: Entry point of the screw (point A) was an intersection between the central axis of the cylinder and the posterior cortex of sacrum. The maximum length of screw was the distance from the posterior cortex to the anterior cortex of sacrum follows the central axis of the cylinder (from point A to B). Angle α indicates the medial angulation of the screws on the transverse plane. Angle β indicates the angulation between pedicle and the superior endplate on the saggital plane (Figure 3). Statistical analysis was performed with SPSS19.0 software, and the results were presented as mean ± standard deviation. The measurements between male and female were compared with an independent samples t test. The statistical difference was considered significant when P<0.05. Figure 3: Parameters of the pedicle screw on the transverse plane. The safe zone of S1-4 looks like capital “K” in 3Dreconstruction on the transverse plane (Figure 2a). The shape of the narrowest portion of “K” in S1-2 shows inverted triangle “” on coronal section (Figure 2b). For S3-4, the narrowest portion of “K” is diamond-shaped (Figure 2d). All the results were summarized in Table 1. The data was analyzed in the gender group. For S1 pedicle screw, the mean entry point was 9.03 ± 1.35 mm below the superior endplate of S1, 11.23 ± 1.79 mm above the first posterior sacral foramina, and 29.25 ± 2.16 mm lateral to the median sacral crest. This point was approximately lateral to basilar part of S1 superior articular process. The maximum mean diameter and length of screws was 11.93 ± 1.47 mm and 39.97 ± 3.55 mm respectively. The medial angulation was 25.18 ± 5.04°, and the screws were parallel to the superior endplate of S1 on the sagittal plane. AB-was the distance from the posterior cortex to the anterior cortex of sacrum follows the central axis of the cylinder, which presents the maximum length of screw. Table 1. Relevant parameters of S1-4 pedicles (mean ± SD). For S2 pedicle screw, the mean starting point was 5.56 ± 1.00 mm below the first posterior sacral foramina, 6.99 ± 1.37 mm above the second posterior sacral foramina, and 23.07 ± 2.43 mm lateral to the median sacral crest. This point is approximately 1 mm superior and 1-3 mm medial to the midpoint of a line connecting the inferior outer edge of the posterior foramen of S1 and superior outer edge of the posterior foramen of S2. The maximum mean diameter of screws were 6.09 ± 1.94 mm, and the screw mean length was 26.78 ± 2.79 mm, the mean angulation was 27.96 ± 7.15° medially in the transverse plane and 4.34 ± 6.93° caudal to the superior endplate of S2 on sagittal plane. For S3 screw insertion, the mean entry point was 5.3 ± 0.78 mm below the second posterior sacral foramina, 6.87 ± 1.48 mm above the third posterior sacral foramina, and 24.68 ± 2.96 mm lateral to the median sacral crest. This point is approximately superior to the midpoint of a line connecting the inferior outer edge of the posterior foramen of S2 and superior outer edge of the posterior foramen of S3. The maximum mean diameter and length of screws was 5.58 ± 0.83 mm and 22.57 ± 2.75 mm respectively. The mean angulation was 48.64 ± 7.88° medially in the transverse plane and 3.63 ± 7.04° caudal to the superior endplate of S3 on sagittal plane. With respect to S4 screw insertion, the mean entry point was 4.94 ± 1.07 mm below the third posterior sacral foramina, 5.62 ± 1.37 mm above the fourth posterior sacral foramina, and 20.76 ± 2.23 mm lateral to the median sacral crest. This point is approximately 1 mm superior and lateral to the midpoint of a line connecting the inferior outer edge of the posterior foramen of S3 and superior outer edge of the posterior foramen of S4. The maximum mean diameter and length of screws was 5.48 ± 0.90 mm and 17.27 ± 2.21 mm, respectively. The mean angulation was 54.73 ± 3.64° medially in the transverse plane and 13.72 ± 5.88° cephalad to the superior endplate of S4 on sagittal plane. As for S2 in gender group, the distance from the entry point to the superior edge of S2 posterior foramina (L2) and sacral midline (L3) were 7.21 ± 1.80 mm , 22.84 ± 1.58 mm and 6.84 ± 1.03 mm 23.20 ± 2.85 mm in male and female respectively, which means the entry point of pedicle screw was more higher in male (P =0.015). The diameter of screw in S3 was 5.71 ± 0.69 mm and 5.51 ± 0.91 mm in male and female respectively also showed statistical difference (P=0.044). There were no other statistically significant differences in parameters in gender group. Surgical treatments for adult spinal or pelvic fracture often include sacral fixation. Precise sacral fixation is a challenge for surgeons to manage. Proper screw placement is essential for obtaining adequate bony purchase for solid fixation. Pedicle screws that perforate the pedicle cortex may increase the risk of neural damage, visceral or vascular complications, and the failure of fixation [1-6]. Injury to adjacent vital structures during screw placement remains a major concern because of the complex anatomy of the sacrum. The sacrum is a trapezoidal structure and has no true pedicle. There is much bone mass on the anterior and lateral sides, and these regions are suitable for screw placement. We define the pedicle as the areas between the transverse process and the sacral body. Most of research about the entry point of sacral screws presented the results based on cadaver or computed tomography study. The reliability of the data would be influenced by the insufficient or shrinkage of the pelvic specimen, meanwhile, the accuracy of results would be affected by subjective measurement. This study was performed to demonstrate the three-dimensional models of pedicle screw safe zone using the software of Mimics based on an analysis of CT data. Mimics are highly integrated software which allows the operators to process 2D image data to construct 3D models with precision. It is widely used in 3D printing technology and biomechanical analysis in recent years [7,8]. The entry points of the pedicle screws can be accurately localized and the plane and the direction of the screws can be determined. The use of such software increases the accuracy and reliability of the measurements. We find that the safe zones of S1-4 were Kshaped in 3D-reconstruction. Three-dimensional model analysis revealed the height of the pedicle isthmus as the limiting variable for secure screw insertion. Mark a maximum inscribed circle at the pedicle isthmus, we can determine the accurate enter point and the maximum diameter of the pedicle screw. In this research, we found that the length of S1 pedicle screw was 41.20 ± 3.90 mm in male and 39.25 ± 3.17 mm in female. The maximum mean diameter and length of screws were 11.93 ± 1.47 mm and 39.97 ± 3.55 mm respectively. This was consistent with the results obtained by Xu , they suggested that the average length of the pedicle screw of S1 was 43.7 mm for males and 41.7 mm for females. Kwan  have conducted an study to evaluate the morphometry of S1 in the Asian population, there were 90 females and 90 males CT scans of pelvis were measured, they suggested that the screw length was from 35.0 ± 3.0 to 58.3 ± 3.1 mm in males and from 31.9 ± 2.6 to 53.1 ± 3.5 mm in females, there was statistically significant difference between males and females. They argue that the longer screw can be inserted which corresponded to a maximum angulation, but that means the thin screw will be needed. We recommend that the maximum diameter, the accurate enter point, and the proper length of screws was important to the stability of fixation. With regard to S2 screw placement, many researches have been reported and the entry point was variable. Kim  suggested the screw was placed in the midpoint of the line connecting the inferior edge of S1 posterior foramen and the superior edge of S2 posterior foramen. Kwan have the same opinion with Ebraheim , they all argued that the entry point was an intersection between a vertical line through the S1 and S2 dorsal foramina and midway between these dorsal foramina. 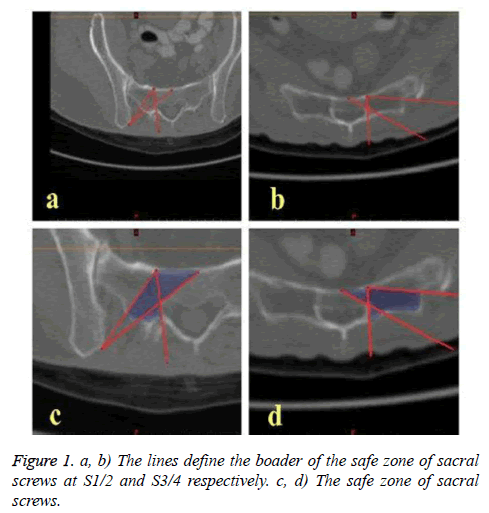 Liu  made an anatomic study on the placement of the second sacral screw in 15 adult dry sacrum specimens. They presented that the screw length was 27 to 35 mm, and the medial inclination angle was between 30° and 45°. This was close to our findings. But the entry point they argued at the intersection of the horizontal line passing the lowest point of the inferior edge of S1 posterior foramen and the sacral lateral crest, which have little difference with ours. As for the various entry point of pedicle screw reported, we believe that several factors may have contributed to such findings, including the method, the subjects, and miscalculation. Different entry point corresponded to different angulation, width, and length of the screw, as a result, the extraction force would be difference which could affect the fixation of screw. In our study, an intraosseous cylinder traversing the inscribed circle at the pedicle isthmus to represent the trajectory for maximal safe zone size of a pedicle screw. The optimum enter point, the maximum diameter, and the appropriate length of the pedicle screw, which would made maximum holding force and secure a safe and firm fixation, have been determined. Displaced sacral fracture combined with neurological deficits is an indication for open reduction and internal fixation [14-16]. Zelle  suggests that surgical operation would increase the degree of functional and neurological recovery. A variety of surgical interventions for stabilization were performed, however, the optimal management remains unclear. Robles  reviewed relevant English language literatures from 1975 to 2006, and presented that surgery were performed in 77% of 90 patients, only 35% of that underwent laminectomy and stabilization operation, the method of stabilization main include percutaneous sacroiliac screws , lumbosacral pedicle screws extending to S2 , and lumbopelvic constructs [21,22]. The fixation of pedicle screws at scrum, especially at S34were seldom reported. Harma  reported that transforaminal sacral fractures were treated with posterior iliosacral instrumentation, in which screws were placed on the contralateral intact S1 and S2 pedicles, and no patients with a poor functional outcome. Sommer  have reported only 2 patients with the fracture of sacrum and sternum respectively treated with the locking compression plate system, the screw were placed at S3, S4 and sternum, but the specific entry point were not reported. In this research, we have demonstrated the safe zone of S1-S4. Meanwhile, given the S3 and S4 were not involved in the transmission of weight from the lower extremities, the pedicle screw in S3, S4 can meet the requirement of internal fixation, the fixation of pedicle screws of S3, S4 would be an effective method for sacral fracture. To our knowledge, our study is the first to present the 3D model of the S3 and S4 for effective placement of pedicle screws. It must be noted that the maximum length and diameter of the safe zone of pedicle screws at S3 and S4 were significant different from that at S1and S2. Especially at S4, the diameter and length of pedicle were less than 1/2 of S1, which meanings more difficulties will be meted when inserting screw and the improper inserting may lead to the failure of fixation. There was a little significant difference between male and female in the entry point at S2. We consider the different morphology of pelvis between male and female may contribute the finding. Meanwhile, the hyperostosis, osteoporosis, and degeneration may lead to difference entry point and angulation. Such subtle variations should be taken more consideration in clinic. In short, proper fixation attributed to the accuracy entry point, angulation, the length of pedicle screw, and the preoperative radiological evaluation. In this study, the optimal entry point obtained based on the premise of the maximal diameter of screw. With the change in the diameter of screw, the length and angle will be changed. We have not taken more consideration on the best combination of the length to diameter, further research for the correlation between the length and diameter were needed. Proper screw placement is essential for obtaining adequate bony purchase for solid fixation. These studies provide data on the safe zone of pedicle screw, which may give the effective placement of screw. Meanwhile, Pedicle screws of S3 and S4 should be taken more consideration in the treatment of certain type of sacral fracture. Amato V, Giannachi L, Irace C, Corona C. Accuracy of pedicle screw placement in the lumbosacral spine using conventional technique: computed tomography postoperative assessment in 102 consecutive patients. J Neurosurg Spine 2010; 12: 306-313. Robert W, Gaines JR. The use of pedicle-screw internal fixation for the operative treatment of spinal disorders. J Bone and Joint Surg 2000; 82: 1458-1476. Lonstein J, Denis F, Perra JH, Pinto MR, Smith MD, Winter RB. Complications associated with pedicle screws. J Bone and Joint Surg 1999; 81: 1519-1528. Okuda S, Miyauchi A, Oda T, Haku T, Yamamoto T, Iwasaki M. Surgical complications of posterior lumbar interbody fusion with total facetectomy in 251 patients. J Neurosurg Spine 2006; 4: 304-309. Rivet DJ, Jeck D, Brennan J, Epstein A, Lauryssen C. Clinical outcomes and complications associated with pedicle screw fixation-augmented lumbar interbody fusion. J Neurosurg Spine 2004; 3: 261-266. Vaccaro AR, Garfin SR. Internal fixation (pedicle screw fixation) for fusions of the lumbar spine. Spine 1995; 20: 157-165. You W, Liu LJ, Chen HX, Xiong JY, Wang DM, Huang JH, Ding JL, Wang DP. Application of 3D printing technology on the treatment of complex proximal humeral fractures (Neer3-part and 4-part) in old people. Orthop Traumatol Surg Res 2016; 102: 897-903. Ren D, Liu Y, Zhang X, Song Z, Lu J, Wang P. The evaluation of the role of medial collateral ligament maintaining knee stability by a finite element analysis. J Orthop Surg Res 2017; 12: 64-74. Xu RM, Ebraheim NA, Yeasting RA, Wong FY, Jackson WT. Morphometric evaluation of the first sacral vertebra and the projection of its pedicle on the posterior aspect of the sacrum. Spine 1995; 20: 936-940. Kwan MK, Jeffry A, Chan CYW, Saw LB. A radiological evaluation of the morphometry and safety of S1, S2 and S2-ilium screws in the Asian population using three dimensional computed tomography scan: an analysis of 180 pelvis. Surg Radiol Anat 2012; 34: 217-227. Kim JH, Horton W, Hamasaki T, Freedman B, Whitesides TE, Hutton WC. Spinal instrumentation for sacral-pelvic fixation: a biomechanical comparison between constructs ending with S2 bicortical, bitriangulated screws or iliac screws. J Spinal Disord Tech 2010; 23: 506-512. Ebraheim NA, Lu J, Yang H, Heck BE, Yeasting RA. Anatomic considerations of the second sacral vertebra and dorsal screw placement. Surg Radiol Anat 1997; 19: 353-357. Liu JC, Li Y, Wu YT, Zhu QS. An anatomic study on the placement of the second sacral screw and its clinical applications. Arch Orthop Trauma Surg 2013; 133: 911-920. Hessmann M, Degreif J, Mayer A, Atahi S, Rommens PM. Transverse sacral fracture with intrapelvic intrusion of the lumbosacral spine: case report and review of the literature. J Trauma 2000; 49: 754-757. Sapkas G, Makris A, Korres, Kyratzoulis J, Meleteas E, Antoniadis A. Anteriorly displaced transverse fractures of the sacrum in adolescents: report of two cases. Eur Spine J 1997; 6: 342-346. Suzuki K, Mochida J. Operative treatment of a transverse fracture-dislocation at the S1-S2 level. J Orthop Trauma 2001; 15: 363-367. Zelle BA, Gruen GS, Hunt T, Speth SR. Sacral fractures with neurological injury: is early decompression beneficial? International Orthopaedics 2004; 28: 244-251. Robles LA. Transverse sacral fractures. The Spine J 2009; 9: 60-69. Kim MY, Reidy DP, Nolan PC, Finkelstein JA. Transverse sacral fractures: case series and literature review. Can J Surg 2001; 44: 359-363. Hessman M, Degreif J, Mayer A, Atahi S, Rommens PM. Transverse sacral fracture with intrapelvic of the lumbosacral spine: case report and review of literature. J Trauma 2000; 49: 754-757. Schildhauer TA, Bellabarba C, Nork SE, Barei DP, Chip Routt ML, Chapman JR. Decompression and lumbopelvic fixation for sacral fracture-dislocations with spino-pelvic dissociation. J Orthop Trauma 2006; 20: 447-457. Templeman D, Goulet J, Duwelius P, Olson S, Davidson M. Internal fixation of displaced fractures of sacrum. Clin Orthop 1996; 329: 180-185. Harma A, Inan M. Surgical management of transforaminal sacral fractures. Int Orthopaedics 2005; 29: 333-337. Sommer C. Fixation of transverse fractures of the sternum and sacrum with the locking compression plate system, two case reports. J Orthop Trauma 2005; 19: 487-490.